Ladies and Gentlemen, please, may I present to you my vegan, gluten-, dairy- and even sugar-free brunch treat that I have been announcing in the last two posts: black rice pudding with coconut milk. I have only once been to Thailand and only for a stopover but I still made sure I had some of the famous sticky rice and mango and this dish is very much inspired by it. However, I didn’t have mangos around but thought papaya would work just as well and I was right. 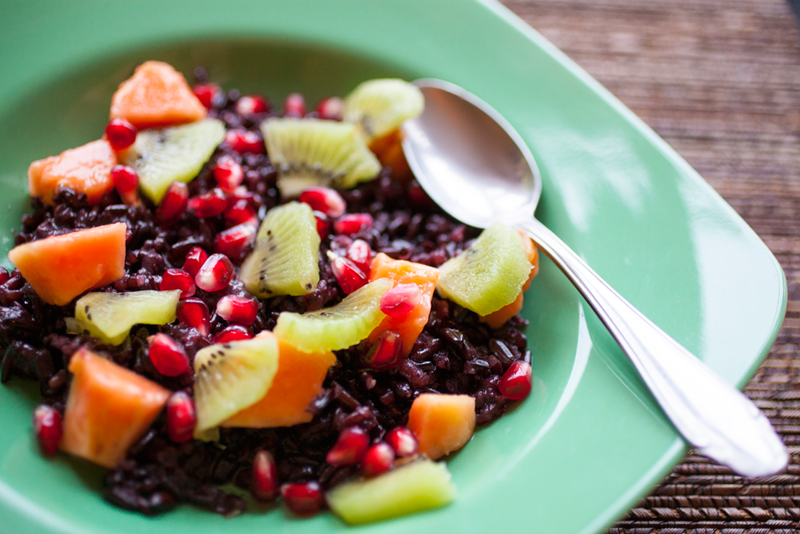 For colour I also added kiwi and pomegranate and I’m sure you can use any kind of fresh fruit you fancy on top of the rice. Just remember that you have to start by soaking the rice overnight, so start making your breakfast in the evening. Drain and rinse the rice that has soaked overnight. Place the rice in a heavy bottom sauce pan and cover it with the coconut milk and water. Add the pinch of salt and vanilla essence and bring to the boil. Reduce the heat and let the rice cook for about 25 – 30 minutes until most of the liquid is absorbed and the rice is tender. While the rice is cooking, prepare your fruit, so you have it ready to serve with the rice pudding. When the rice is cooked, stir the agave syrup under and plate the rice pudding into bowls. Top it with the fresh fruit and pretend you’re on holiday in Thailand! This entry was posted in Healthy and tagged alternative, black rice, breakfast, brunch, coconut, cream, dairy-free, delicious, delight, dessert, dish, easy, easy recipe, gluten free, lowfat, rice pudding, sticky rice, sugar-free, super easy, thai rice. Bookmark the permalink.